The goals scored by Bernard Brogan and Andy Moran were crucial but so were the raft of injuries. 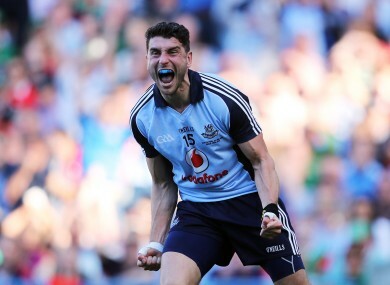 Bernard Brogan scored two crucial goals for Dublin. DUBLIN LOST TWO key players before the ball was even thrown in for the second half. Paul Mannion lasted 14 minutes after picking up an early knock. Jack McCaffrey, who had scored in every preceding championship game, was withdrawn at the break while Mayo replaced Tom Cunniffe for Cathal Carolan. Ciaran Kilkenny then last four minutes into the second half before Dean Rock came on in his place. It looked like Dublin boss Jim Gavin was going to pay for his tinkering as Rory O’Carroll took a heavy blow with 10 minutes on the clock. All five Dublin substitutes had been used and O’Carroll was certainly dazed but he finished out the match. Mayo led 0-4 to 0-1 after 16 minutes and Dublin had wasted a few points and goalscoring chances. Eoghan O’Hara was on for the injured Mannion and both Diarmuid Connolly and Stephen Cluxton had missed frees. Paul Flynn pumped in a high ball and, with the sun in their eyes, Ger Cafferkey and Bernard Brogan prepared for it to come into their orbit. Goalkeeper Robert Hennelly flung that script out the window as he steamed out and flailed a punch. There was no harm in taking the decision but Hennellys execution was poor. He cleaned out his defender and Brogan was left to flick the ball past him for a goal that settled The Dubs. Dublin outscored Mayo five points to one after the break and went 1-9 to 0-9 ahead after 48 minutes. 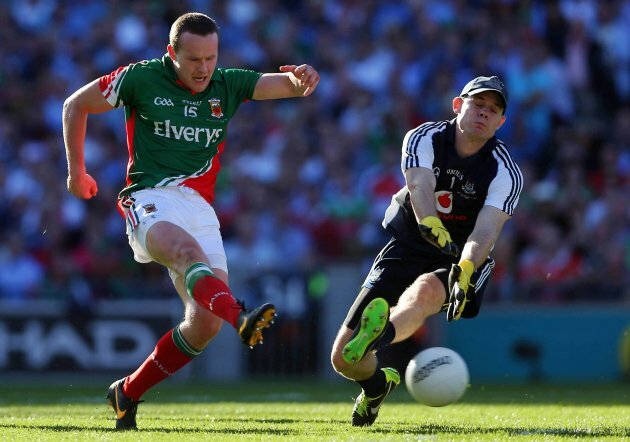 Mayo desperately needed a boost and got one when Andy Moran claimed a high ball and did a one-two with Michael Conroy. Cluxton, who had rushed out in anticipation of the original pass going long, found himself in no-man's land as Moran readied himself to shoot. Cluxton tried to close Moran down but the Ballaghaderreen man coolly slotted home to level the match. Denis Bastick, on the pitch less than two minutes after replacing the injured Johnny Cooper, was involved in a sweeping Dublin attack that saw him link up with Michael Darragh MacAuley and bear down on the Mayo goal. Bernard Brogan was waiting by the square, unmarked, as a simple break through the half forward line became a three-on-one. MacAuley opted out of shooting himself but his pass found Brogan, who swatted in. Dublin would not give up the lead again. Jim Gavin kept faith in Ger Brennan after he was given the run-around by the Kerry forwards two weeks ago. The St Vincent's man had a fine game against Mayo and was an indefatigable presence all afternoon. He popped up in the 64th minute to land a superb, right-footed point on the run. Gavin's U21 stars have received much of the credit but a core group of the 2011 All-Ireland-winning team -- Brennan, Brogan and Cluxton particularly -- were needed to get The Dubs over the line. Email “5 key moments from Dublin's win over Mayo”. Feedback on “5 key moments from Dublin's win over Mayo”.